So, this is something I plan to also do for the return of "Supernatural" on the 21st, and hopefully the "Lost" premiere on February 2nd. I would just tweet, but I may need more than 140 characters, and this way, anybody who wants to read this, can just read it without having to fish through their Tweet Deck or whatever. Twitter is a fun reactionist tool, but it's not great for continuity of thought or analysis. Anyway, (very) quick preface: I only just discovered "Chuck" maybe a month or so ago. In that time, I've fallen in love with each and every aspect of the show, from its unabashed desire to both please and challenge us to its willingness to reinvent both the spy genre and the forty-five minute broadcast TV time slot. 9:01: Not entirely convinced by Chuck's mean face...but I think that's part of the irony, why this show is so different from anything else out there. I also really appreciate that Levi is...well...lanky and awkward. 9:06: Agent Sarah Walker is, I think, the greatest female character on TV right now. She's young, beautiful, but she's a real woman, who's tall and strong, who has a job that's typically attributed as "male," and Strahovski is, yes, impressive. And only this show can get away with a scene in which its leading lady exits a swimming pool in a white bikini, soaking wet, swinging her blonde hair around. This show gets away with so much because of how strong Sarah Walker is. 9:09: Okay, thank god that was a car commercial, because I was going to say..."This feels like a car commercial." 9:13: I don't really like grungy, hairy chuck with the cheese puffs...But I always enjoy any physical manifestation of a character's inner state of mind. Related: Morgan looks great! 9:18: Back to the Buy More? I do hope so. The Buy More is always such a fantastic sounding board for most plot-related issues in the show, even some issues of interiority with Chuck and the gang. "Chuck" is at its best when it really works that tendency toward parallel narratives, because this creates a singular kind of resonance that is either hysterically funny or surprisingly poignant. 9:22: Oh yeah. "Heroes." THAT show deserves cancellation. 9:27: So there's a new goal, now, for "Chuck," which is balance. 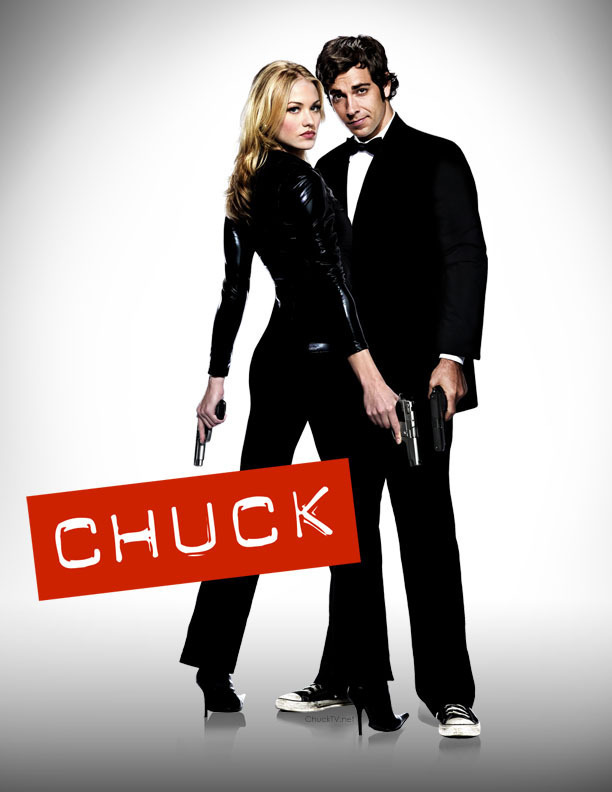 How can we achieve that balance between Chuck Bartowski's natural propensity for the awkward, and his new-found Spy skills. I think, so far, things are doing alright. Although I'm still not convinced. I still wish he was a normal goof. Still, I understand this as part of the progression of the show, and I'm willing to see it through. 9:36: I like it when they let Casey have a feeling. Or an opinion. Because he's complex, and I really do look forward to learning more about him. 9:37: HOLY WTF MOMENT. That was weird a little. Emmett dies...I wonder at the purpose. I'm shocked, but perhaps this is the writers' way of asking us to watch the show differently now. To accept its maturation as, not just a comedy, but a drama as well. 9:44: There's budget going on here. Bigger budget. Look at the colors even, just in the frame. The show feels a little like a fairy tale. Note to self: work that out for future post. 9:48: "Chuck, what happened?" "Something...awesome." 9:55: Buy More! And look! It's not a total reboot this season. We're back at the Buy More. Morgan, Casey, and all. Oh, the good times that shall ensue. 9:58: Eye of the Tiger! Tear. Sniffle. Man, I miss my Winchester boys. Phew! I am fatigued. Only made it through half of tonight, but I can't wait to write about "Chuck" again.